View our gold diamond rings here. 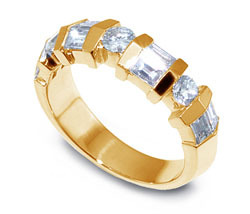 Few rings are more traditional or classier than gold diamond rings. Whether used for wedding rings, engagement rings, promise rings, or simply for personal adornment, gold diamond rings really do, to coin a phrase, set the gold standard. Gold looks beautiful on almost anyone, and so do diamonds; and for that reason alone it's hard to go wrong with any gold diamond ring, fancy or plain. Jewelers discovered this can't-miss combo hundreds of years ago, and gold diamond rings have been a favorite of those who could afford them (and many who couldn't) ever since. Besides their general attractiveness, gold diamond rings may have remained so popular partly because of the fact that they're relatively easy to craft. While it takes skill to make any ring, and it certainly requires deftness and a sure touch to cut and facet a diamond, gold itself is quite easy to work. Gold diamond rings begin with molten gold poured into a mold (gold has a relatively low melting point). After the metal has cooled, the new ring is taken out of the mold and the final touches are added to make it a genuine gold diamond ring. It is polished, the setting added (usually by soldering), and the stone placed carefully in the setting. Tighten a few prongs, and viola! A brand new, genuine, gold diamond ring. Some gold diamond rings sport specialty bands that have to be made from gold wire, but the principle's basically the same. One choice you have to face when shopping for gold diamond rings is, of course, the stone and its four C's -- color, clarity, cut, and carats. Once you've made that difficult decision, you have to decide what kind of setting you want. Many gold diamond rings display traditional single-stone settings, but of course there are always multi-stone channel settings, invisible settings, pavé settings, and the like to choose from. Then, too, you may always opt for a tension setting, in which the stone is held in place by the springiness or tension of the band itself. Although gold diamond rings with this type of setting let light shine clear through the stone unimpeded, allowing it to become absolutely brilliant, this is one of the rare circumstances in which the setting dictates the style of band. Gold diamond rings made this way tend to be large and clunky, because even alloyed gold isn't all that strong. If you don't like the clunky look, steer away from gold diamond rings with tension-mounted diamonds. As for the gold itself, you have plenty of choices there, too; gold alloys with other metals very well, and you'll find mixes ranging from 8 karat (1/3 gold) to 24 karat (pure gold). Gold diamond rings made with 18-24 karat gold tend to be easily distorted, and wear away easily -- even plain paper can damage them over time. It's better to focus your attention on gold diamond rings made from 10-14 karat gold, or even white gold, which is a mix of yellow gold and a strong white metal, such as palladium, platinum, or even silver.